Universal Robots’ booth at IMTS 2014. One of the definitive currents I see in the economy of the 2010s is the democratization of technology. Computers and devices cost a tiny fraction of what they did just a few years ago, and the learning curve to operate them has eased dramatically. For a few hundred bucks a person can buy an HD video camera, edit video on a consumer computer and then broadcast what they’ve shot to the world online for free. People can create Web sites with free open source software like WordPress that they can learn to operate in a few days. A person can buy a Haas MINIMILL for $35,000 and make parts in his garage. Universal Robots has continued this democratization of technology with its robotic arms, which sell for between $34,000 to $44,000. For the price of a luxury car, a small machine shop can automate its operation, saving on labor costs by automating applications such as pick and place processes. Also, the simplicity of the robots decreases the need for skilled labor because the robotic arms made by Universal Robots are simple enough that a technically savvy person can learn to program and operate one in a half hour. The company’s robotic arms also create virtual barriers around them for safety if people move too close, a tremendous advancement from traditional robots that require large expensive physical barriers to surround them. It’s not Cyberdyne Systems Model 101 (your favorite cyborg Governor with an Austrian accent), but it can still be a terminator of people — in a machine shop. 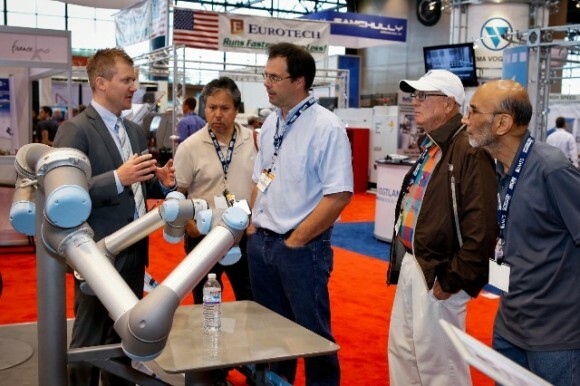 At IMTS 2014, I visited the Universal Robots booth and interviewed the company’s CEO, Enrico Krog Iverson. I also talked to Empire Robotics’ President, Bill Cully, whose company was sharing the Universal Robots booth. Iverson told me the story of how Universal Robots started. The company was founded in Denmark in 2005. Engineer Kristian Kassow was working on food industry applications for robots — one of the tasks being to place pepperoni on pizza. He combined forces with Esben Østergaard and Kasper Støy, who were working on a PhD project about the market for robots. Their goal was to change the definition of a robot from a heavy, expensive, and unwieldy technology that could only be utilized by small group of people, to a simpler, lighter, cheaper technology that many people could afford and operate. Empire Robotics’ product, the Versaball, which it calls an “agile robot gripper,” has further enhanced the practicality of the robot arms from Universal Robots and those of other robot brands as well. The Versaball, which sells for just a few thousand dollars, has the ability to pick up objects of diverse shapes and materials. Empire Robotics’ team demonstrated how the Versaball, right out of the box, can work together with the robot arms of Universal Robots. It has several sets of holes on its mounting component that make it ready to fit physically onto a variety of robot arm models, more importantly, the Versaball’s computer easily integrates with the computer control of the robot to which it attaches. The Empire Robotics team raved about the robot arm from Universal Robots, saying that the person at the booth operating the robot learned to program it in a day, and he had never programmed any Robots before. Question: Do you feel bad when human workers are replaced by robots? Yes. And they’re coming for all of us. In the next 50 years you will see automation take over more and more of all industries in the same way the Xerox eliminated rooms full of typists. Computers can now write objective news articles. They can take your fast food order. They weld. They assemble. They load machines. This is the tip of the iceberg. As a society we have to think seriously about a post-labor world because there won’t be enough labor for everyone to earn a living. Yes there is the argument that we’ll need robot repairmen, but what happens when the robots can repair themselves? It’s coming. As much as it makes modern “conservatives” scream we will eventually live in a world where labor and income are not married and we have to decide what we want that world to look like. Do we want a world where everyone is provided for(think Star Trek) and our work is our passion, or a world where a super wealthy ruling class lives in luxury and the rest of the population lives in squalor(think Elysium). I already know I’m going to receive backlash for this but if you can’t see it’s the future you’re fooling yourself. Do I feel bad when human workers are replaced by robots? Sure. The same way I feel bad when a perfectly innocent child has needle stuck in them. But as an adult I know the momentary pain of a vaccine injection’s much preferable to the results of the disease against which the vaccine protects. The pattern’s been repeated numberless times and those who war against that pain, by trying to stop the replacement, aren’t particularly well thought of. The term “Luddite” isn’t a compliment and the word “sabotage” carries no positive connotations. As far as I can determine the only remedy would be to drive home the point that things change and if you’re not ready for those changes you’ll suffer more then you need to. If you fight the changes you’ll just lose. “People have tended to dismiss the “luddite” argument against automation taking jobs because it is clear that this just tends to push the population to become more educated and perform more complex tasks that aren’t automated, such as producing the automation technology itself. That is entirely true and a great counterargument, for a finite time. The problem is that this can’t be an infinite process. Automation starts at the simplest of tasks that humans can do, essentially simple labour, and works its way up. As we humans move “up” our range of capabilities, we eventually get squeezed. If you take the entire population and the range of their greatest potential capability, once automation reaches the bottom end of that distribution, there are suddenly people who have no options for employment no matter what they do; there is simply a machine that can do it for cheaper. As automation moves up the capability curve, more and more people fall off it. And, because everybody else is getting squeezed that also increases competition for the remaining types of work, which reduces income, which decreases quality of living. When automation can do everything a human can, better, and cheaper than the basic needs of a human (measured in, say, energy intake), then there’s nothing left for humans to do for employment. Even before that, when the remaining jobs can’t even cover the basic costs of living to survive, we have a serious problem. This automation scenario of the future has often been portrayed as us sitting around all day in luxury with no stress and no needs that aren’t met. That’s the utopian version. The problem is, how to the unemployed people get those goods? They don’t have any money to buy the goods or to buy the automation machinery. As people fall off that curve they don’t get a life of non-working luxury, they end up begging on the street or barely surviving on welfare. The dynamics of capitalism drive us towards the dystopian future of a few megarich with all needs met and the great masses of poor, starving population. When that day comes we will be owned by the Robots and treated like sheep until someone is smart enough to pull the plug. Then we will start over. I have worked for a robot manufacturer since 1982. I think you have to look at robots the way early man looked at horses and oxen. Early man did not see these animals as a threat to his profession, he saw the horse and oxen as a way to do more. I have seen robots doing jobs that people had no business doing, loading machines in confined spaces where inattention leads to loss of limb, and working in hazardous environments (heat, dust, fumes, argon gas). Robots need maintenance, and often the best person for maintenance is the person who used to do that job by hand. Yes people get displaced sometimes, but that is not unique to robots. A willingness to learn is the best way to stay employed. I am an engineer and very little of what I learned in the late 70’s is current. I adapted and that is why I still have a job. Soon it will be your turn Martin Niemöller stated it best. No one is exempt my hope is that a board of directors some where is entertaining a computer CEO to extinguish that overhead. Well put, the robots are coming for all of our jobs until we have none left. I should point out I’m not actually against that, but it will require a massive restructuring of our society. It’s ok, just so they don’t call them Cylons. The movie, “Her” about a guy who falls in love with the voice of a computer (Scarlet Johanson) was very powerful for me. We are not that far away from the time Isaac Asimov predicted man and robot intelligence would overlap (2029). So this is definitely a real consideration. I do not think we can stop this “progress”. I ask my son in law in Silicon Valley, who is working in ths field, if he worries about the outcome of this trend. He says he does not. Arthur Machinery-Florida has sold several UR Robots. The applications are endless, and they don’t necessarily replace workers. Customers are amazed how easy they are to program, especially compared to a Fanuc. Very affordable and versatile. You all need to read the novel “Player Piano” by Kurt Vonegut. It is a1952 dystopian view of life where robots do ALL the work. Anything repetitive and mechanical that a machine can do better than we can is a blessing. When computer software took over typing invoices, some of our office personnel felt threatened; I told them “You don’t want to do something the computer can do. Spend your time in other areas such as customer service.” Later, if the computer broke down and they had to type invoices by hand, you can bet they complained! The truth is the mind has far greater powers than we normally consider and we would do well to develop those powers instead of fearing our tools will make us their servants. The tools are a product of the mind and any tool can be used for good or ill. By looking within for happiness and by cheerfully serving others we will find our ultimate salvation.